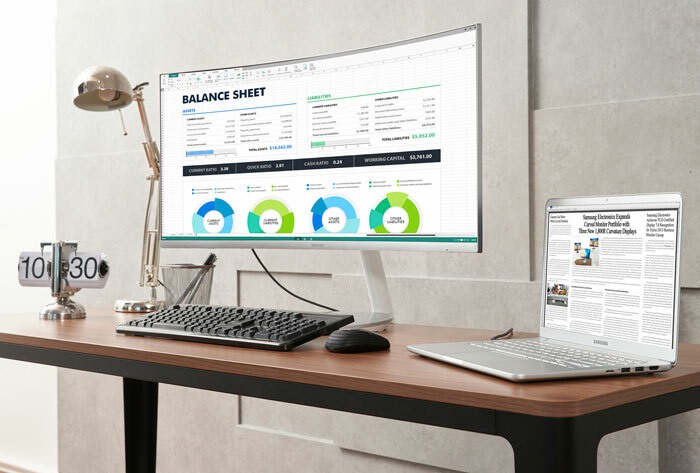 Samsung has launched the world's first Curved QLED Monitor with Thunderbolt 3 at IFA 2018. The new CJ79 is, in brief, a 1500R curved monitor with a 34-inch diagonal and 3440×1440 pixel resolution. Thanks to its QLED panel with quantum dots the display can provide 125 percent sRGB, and the VA panel has a 3,000:1 contrast ratio. The dual Thunderbolt 3 ports transmit display, data and power (up to 85W). "The CJ79 is our latest endeavour in taking curved monitors to the next level that highlights our commitment to innovation. 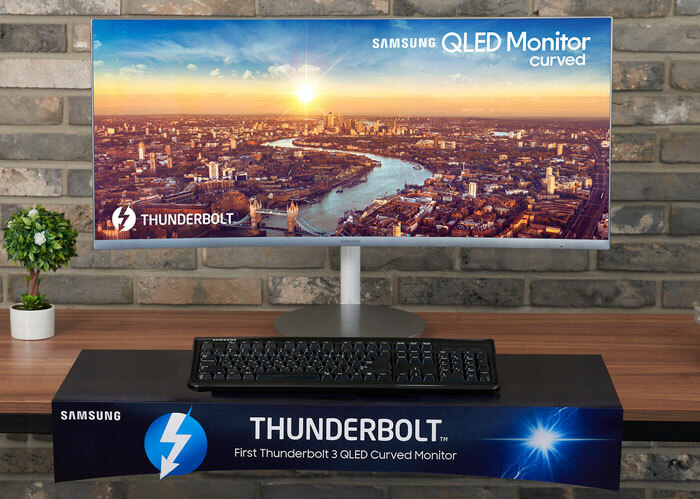 The addition of Thunderbolt 3 connectivity aligns to that vision and connects customers to infinite possibilities," said Seog-gi Kim, EVP of Visual Display Business at Samsung Electronics, in a prepared statement. In the CJ79 Samsung employs a VA panel with wide colour gamut and high contrast thanks to lever aging quantum dots. It promises wide viewing angles, pristine shades, deeper blacks and brighter whites. 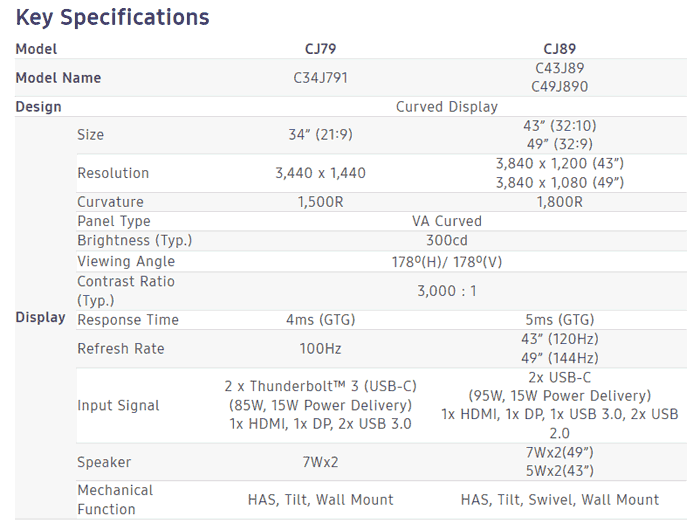 In terms of performance the CJ79 has a response time ofg 4ms, and a max refresh rate of 100Hz. Those who might be interested in gaming on this diusplay might be happy to hear it features AMD FreeSync technology. If you aren't interested in curved screens then this new 34-incher will definitely not appeal as it has a 1500R curve, which Samsung refers to being the "industry's sharpest" - its most pronounced curve. To aid in immersion the supplied stand is adjustable in height and tilt - and of course position. In use the 3440 x 1440 curved display, with a 21:9 aspect ratio, offers an ultra-wide view and workspace. To make the most of this Samsung has enabled PBP and PiP multitasking modes. PiP is particularly configurable with the ability to resize the second source to up to 25 percent of the screen and position it anywhere. Samsung, and a testimonial from Intel, talk up the value of the Thunderbolt 3 ports in the CJ79. As well as the connectivity options mentioned in the intro (transmit display, data and power delivery) the interface can be used for convenient docking. Other interfaces available in the CJ89 are; 1x HDMI, 1x DP, 2x USB 3.0. It has 7Wx2 stereo speakers too. 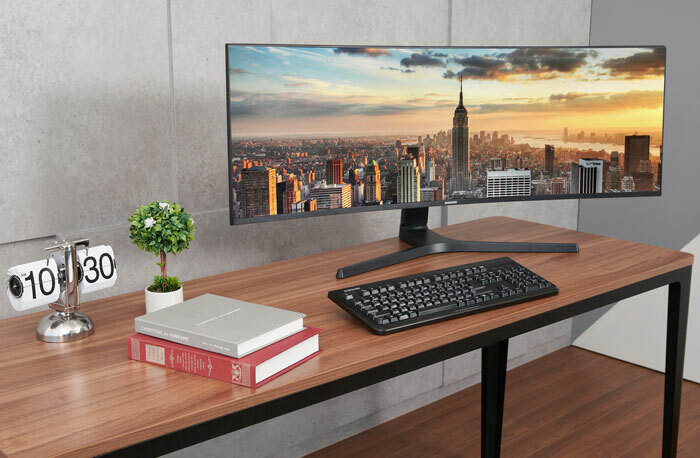 At IFA 2018, Samsung also introduced the CJ89 (Model name: C43J890) with a 43-inch super ultra-wide curved monitor and 3840 x 1200 resolution (32:10 aspect ratio), pictured above. The design includes a built-in KVM switch, USB-Type C ports, and built-in stereo speakers. Samsung's CJ79 and CJ89 monitors are currently available in Europe and will be available worldwide shortly. It's the black blur, overshoot, and colour accuracy I'm concerned about on VA panels. £899? Is this really worth that much over 2 * 24" monitors?